The 1965 Player's Mustang special edition was painted dark blue and white to match the Player's cigarette package. 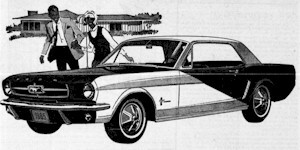 The Mustangs were used to promote the cigarette by the John Player and Sons division of Imperial Tobacco Canada. Contests to win them ran in many Canadian Provinces such as Quebec, Manitoba, Ontario, and Alberta from 1965 through 1968. Besides the unique paint they all were hardtops with 200ci 6-cylinder engine, full wheel covers, and an AM radio. Submitted by a viewer, this ad placed in the September 5th, 1965 edition of Le Petit Journal says Player's Mustang-A-Week contest. Will you be a winner? A spirited Mustang hardtop Ford will be given in prizes every week. Read the instructions below and enter the contest as often as you like, it is very easy. Maybe you're one of the lucky winners. This ad says that 15 of the unique blue and white 1965 Mustang Player's special edition hardtops will be given away weekly between June 16th and September 22nd, 1965. Player's promotions like this occurred in many Providences in Canada between 1965 and 1968.